This is one great little piece of hardware. With seemingly never-ending battery life, very small dimensions, and easy control, it's an all-around great product. The remote makes things really easy to access. Sound quality is great (for my standards) when used with decent-quality headphones. I used a pair of Sony MDR-G72LP phones on the go and some Sony MDR-F1's at home. Audio quality was nice on both of them. There seems to be a bug with the player though; if you power on the unit and it says Bass 2, it actually defaults to Bass 1. One needs to hit the sound button a couple times to refresh it to Bass 2. Great unit, I reccomend it. Durable, Good Battery Life, Looks Cool Too. Remote is really convenient as well. I got the CD player in September, I loved it it had great sound came with a set of earbuds, carrying case, batteries and carrying cases, battery cylinder and adapter. It sounds great and pays for itself in battery life but I am some glad that I bought the 3 YR warranty for $60.00 I had a real problem with the thing, they tried to fix it twice once locally and then to the Sony Lab in Ontario still no luck. So I am getting a replacement. At least they are taking responsibility for there equipment. All in all it''s a good buy and considering the battery life it''s even better. But don''t believe the 80 hour stamina(that will last only about 30 hours) but hey it''s cool. The 80 hours is done with continued play no bass and AVLS on. Well-made, great sound, good looking, long-lasting battery, not too expensive, small and light. None that are really relevant. I auditioned many portable CD players before deciding on this one. Not only was this the best built one and almost the smallest one, it was also the best sounding of the current crop. I compared it to a number of Panasonic models, as well as some Aiwa and Philips models, and this was hands down the best. The headphone amp might not be powerful enough to drive my Sennheisers that I use at home, but its plenty strong enough for most high-sensitivity headphones. The batteries last forever too. Not too expensive by standards set just a couple of years ago. Highly recommended. I had been shopping for portable CD players that don't skip and sound good or great. But until I found the Sony D-EJ925, every player that I had owned either skipped at least occasionally while walking or had no more than mediocre sound quality. My Panasonic SL-CT470 came the closest to my ideal - again, until I found the D-EJ925. The D-EJ925 - dressed in metallic silver (for U.S.-market versions; some non-U.S. versions also come in blue and green, as well) - was very slim but quite weighty. That gave the EJ925 a solid feel. That slimness is the cause for the player to require the use of the "gumstick" rechargeable batteries inside the player, of which a pair of NH-14WM NiMH rechargeables are included. (Surprisingly, the batteries that came with my unit were partially charged, just as the NiMH AAA rechargeables that came with my Panasonic SL-CT470 were; I could play CDs for a few hours with either unit right off the bat.) Fully charged, the D-EJ925's batteries should last well over 20 hours between charges. OK, I've discussed the features of the D-EJ925, but how does it perform? Very well, indeed. Not the best-sounding portable CD player ever made, but better-sounding than most recent players that I've heard. (The Panasonic SL-CT470 sounded slightly better than the D-EJ925, but the former's anti-skip circuitry degrades the sound slightly.) The G-Protection anti-skip - which by the way can be turned off (though Sony had labeled the "Off" position "1" and the "On" position "2") - gives the D-EJ925 virtually skip-free performance without screwing up the player's sound. (The D-EJ721 also has G-Protection, but the feature on that unit didn't work quite as well as advertised.) The headphone output isn't as loud as the Panasonic SL-CT470 - but that may be because the SL-CT470's headphone jack has a relatively "forward" sound (the D-EJ925's sound is slightly "laid back"). Sony seems to have fixed the dreaded "my CD stops playing for no apparent reason" syndrome with this year's crop of CD Walkmans, judging by the reliability of my D-EJ721. Overall, the Sony D-EJ925 is one of the best portable CD players this year. (Let's hope that its successor model - the D-EJ955, coming this spring to the U.S. - will maintain this same high level of quality.) But is it worth its $200 price tag? It's up for you to decide. Low headphone amp output, sound not as good as some older PCDP's, small buttons on side of unit, top cover scratches easily. The D-EJ925 has been money well spent for a portable CD player. I tried out a cheaper D-EJ621 with my MX 400 buds, and the sound was awful. I thought that Sony must make a decent-sounding PCDP, and checked out Sony's Website for various models. The 925 appealed to me, right away, with its very slender shell and the fact it used the long-life (but high cost!!) NH-14WM 'gumstick' batteries, which I'm familiar with from using the MZ-R909 MD recorder. I did some checking on the Web for reviews, and most were poistive. I decided to take a bit of a chance (without actually auditioning the 925), and ordered the PCDP from Sony Canada, on-line. My first impressions were good, as the sound was nice and FAR better than the cheaper 621 unit. I decided that I needed the "Bass 1" setting to have a decent bottom end. The highs are not as super crisp as I'm used to with my MD listening experiences, probably due to the EQ settings on the headphone amp being quite "flat," I would surmise; with the R909 MD recorder, I have 8-step bass/treble controls whihc would have been *most* welcome on this (or any) portable CD player. It took a few hours to charge up the gumsticks and, after what must be 50 hours of steady use, they still have some juice left in them! Amazing. However, be forwarned that these batteries cost about $50 a pop to replace when they die.....Sony claims about 300 recharges with them, but we'll see about that...Also, there is a AA cells external pack, but why bother using it? All in all, I'm happy with the D-EJ925. I do have a pair of KSC-35's on order that should bring even more life from the unit, especially for rock music. I have a pair of MDR-E888's that work miracles with classical and jazz, and REALLY sound fantastic on my MD units, but seems a trifle dull and not totally suited for the 925. I would say that most, if not all, new portable CD players seem to emphasize the bass end of the spectrum, so one has to find the right headphone match for the amp. Highly recommended in my books. I took a look at the specs on Sony's site for this and other recent portable models, and _all_ of them indicate a frequency response range of 20hz - 20khz. That doesn't even conform to the CD spec that they helped define over 20 years ago! Why on earth would they purposely cut out some of the highs in order to emphasize the rest of the audio? It sounds muddy, albeit not distorted. And the mega-bass settings are just ridiculously overpowered. I should say also that I did my listening test using a pair of Sony MDR-V700 headphones (the kind used by most pro DJs these days), and I can say for absolute certainty that Sony definitely did not intend for this thing to sound anywhere near what a _real_ CD player should. Ergononmics are excellent, it's tight, small, and easy to carry. But if you want something that sounds great, I highly recommend you try before you buy... especially make sure to try several models side by side with the same headphones and songs, so that you can decide for yourself if you can live with what I consider a fatal flaw in this unit. As an Electrical Engineering student at UC Berkeley, I tend to be picky about electronics equipment I purchase. Most of High School days were spent installing high-end car audio systems and I have a very discerning ear when it comes to sound quality. However, I feel that this Sony unit really blows away any other portable CD player on the market. When I first saw it, I couldn't believe how slim it was. The D-EJ925 is only about the size of the CD itself, and half an inch thick! When you open the lid, you will notice how well engineered this device really is. The magnesium lid opens smoothly and latches snugly. Plug in a good pair of headphones and be prepared to be amazed at just how clear and crisp the sound reproduction is. I recommend throwing away the included headphones because they are cheap and just don't do this unit justice. 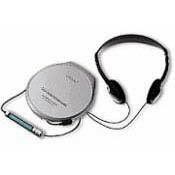 I have a pair of Sony Fontopia headphones which I have used with other discmans but they sounded tinny with no bass. But when I plugged it into the D-EJ925, suddenly they became clearer, with much more midrange and bass. For a minute I thought I was actually listening to my studio monitors plugged into my home audio reciever! The wired remote is both attractive and very functional. I burn CD's with the artist and track names using the CD-TEXT format and then the D-EJ925 will scroll this textacross the Indiglo remote screen and I can tell what songs I'm listening to. I typically get about 40-50 hours of playback time per charge of the internal batteries. Another nice feature of this unit is Sony's new discman technology which keeps the laser aligned with the CD during shaking which may cause skipping. You just can't make this Discman skip, and it doesn't consume tons of battery power like other ESP anti-skip types. Also, this unit has an optical output port to link to any home audio system or minidisc recorder. Overall, I feel that Sony did a great job on this high-end discman and it shows. Don't waste your money on a lesser quality unit, you definately get what you pay for. People come up to me all the time amazed at how small it is. It's a little hard to find (I've only seen it at Good Guys and the Sony Style store) but it's worth it. Don't just take my word for it, check out all the reviews on the D-EJ925 at http://www.epinions.com as well.